À surveiller | Pour boire il faut vendre! Thanks to the participants, the Evening of Folktales and beer tasting on October 17th was a big success! A big thank you to our collaborators, Éric Michaud, storyteller, and Stéphane Morin, sommelier (photo). 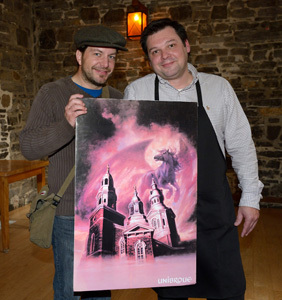 The Musée de Lachine looks forward to a repeat in 2014! This type of event is a concept originated by the Château Ramezay, Historic Site and Museum of Montréal.